I am very excited to introduce you to Eclipse Candle Company. I had never heard of the company until Pam Moore (a rep) contacted me about doing a product review. She invited me to view her site and I was intriqued once I started looking around. She spoiled us by sending a nice package of items for us to review. I am going to list all of the items below for you to view along with info and our review of each. I took our own pictures but they didn't come out very good so I will be using stock photos. I want you to be able to see the details on the warmer. This warmer is absolutely gorgeous. It is dark black with brown highlights around the details throughout the warmer. I loved it in the picture but have to honestly say the picture does not do it justice. You have to see it in person. It is beautiful and fits in great in my kitchen. The colors just tie in with all of my colors and decor. The warmer is 2 pieces. This particular warmer comes with a base that has a plug to insert into an outlet. Located on the cord is a switch in which you can turn it on and off. When it is turned on there is a little red light on the warmer that will light up. It has a bowl that you can place on top of the warmer. You will place your wax cubes into this bowl. You can also take the bowl off and place a jar candle or body melts tin on the warmer too. I love that you can use it in two different ways. Such a great idea!! I have never seen a warmer like it and Love It!!! It is also easy to remove the wax in case you want to switch scents. I just turn it on for a minute or two and then use a spatula to scoop it out. If I just have a little bit left I will just disgard it. 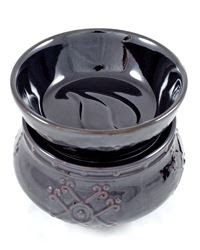 If I have quite a bit left I will turn the warmer on until the wax in the bowl becomes liquid. I will then take the bowl and pour the watch back into the container I took it out of. I then place the container on the counter with the lid open and leave it there until the wax hardens. Once it hardens I close the package and put it away and get out a new scent. I also take a damp papertowel and wipe out the bowl too. We received a package of Memory Melts in the scent Ooh La La Vanilla. Vanilla bean balanced with white cocoa, french vanilla, buttery vanilla cream and subtle hints of brown sugar, rum and cinnamon. I am a huge Vanilla fan so I just knew I would love this scent. My family does too. I love how they partnered it with hints of brown sugar, rum and cinnamon. It is a great combination and I just love the scent as it travels through our home. It isn't to strong just right. I know with some companies the scents can become overwhelming. This is not an issue at all with Eclipse Candle Company. I have a sensitive nose and I had no problem with any of the scents we reviewed. products in the same scent. Those products are the ECC Believes Body Melts and ECC Believes Busy Body Melts. I absolutely love both of these products. I have never seen anything like them before. The larger Body Melts tin can be placed on the warmer. All you do is take the bowl off of the warmer. Then remove the lid from the tin and place it on the warmer. Turn the warmer on and let it heat up the tin and melt the wax and smell the aroma starting to fill your home. It is such a great idea. Now that isn't all you can do with it. It comes with a little black scrapper tool. You can open the tin and use this tool to take a little bit of the wax out. You can then place the wax in your hands and rub it in. You can also rub it throughout your body. On such places as: hands, arms, legs, elbows, feet, etc. I love it and it leaves my skin feeling so smooth and smelling good. My kids love it too. They said they like it better than using lotion. I am not a big lotion fan as I do not like the feeling of it. The body melts are my new best friend as I love the texture. The Busy Body Melts are the exact same thing. It just comes in a smaller 2 fl oz tin. This makes it easy for you to take it with you on a trip or to keep it on your handbag so you always have it with you! We were also sent sample tins of 5 other scents to review also. This is my husbands favorite and one of mine too. It reminds both of us of a mens cologne. Just the right amount of fragrance and not to strong. This is a huge plus with me as I usually cannot stand colognes as they are usually to strong. I absolutely love this scent. It is great in an office, den or bathroom. This refreshing clean fragrance is infused with citrus and basil leaves. This realistic fragrance has sweet creamy bakery notes and just the right amount of fresh tart lemon. The scent has such a yummy smell and I love how it just moved through out entire home. My kids were upstairs when I warmed it and came downstairs asking why I was baking a cake. Gotta Love It!!! Creamy vanilla and warm amber mingle with soft wood notes of cedar, oak, and sandalwood in this inviting fragrance. This was my FAVORITE Scent out of them all. Like I mentioned, I love vanilla and why wouldn't I like Amber??? My name of course!! Well to get to the scent. It just rocks!!! It is a great combinations of scents all rolled in one and I can't get enough of it. I am constantly taking a little bit of the wax and rubbing it on parts of my body. Just LOVE IT!!! Our signature blend of cinnamon balanced with red clove and nutmeg for a spicy year-round favorite. This scent reminds me of the Fall/Autumn time of the year. Reminds me of the changing of leaves, cool crisp breezes and so much more. This is a definate must have for this time of year. I will definately be tucking this tin away until later this year so I can enjoy it. I am orginally from Ohio and now live in Florida. The seasons are just not the same in Florida as we really don't get to celebrate the seasons. This is the perfect way to remember the changing of seasons. I hope you have enjoyed our review of this wonderful companies and their products. I invite you to visit Pam's site to view all of her items and scents. This doesn't even put a dent in all of the items that she has to offer. Why not make a wishlist for the kiddos so you get exactly what you want. Follow Pam's Facebook Page too. Be sure to ask her about her current specials too! She has also been sweet enough to offer a wonderful giveaway to my viewers too. Please look below for the rafflecopter form to enter. The Big Easy Memory Melt! Yum! I would pick Jacob body melt! 7 oz Wickless Memory Melt, sounds yummy! love the Oh La La Vanilla! you make that vanilla mixed with brown sugar, rum and more sound so good I think I can smell it! I would have a hard time! I want all the Character ones, but I also really want Cherry Lime Slushy. Frankly, My Dear... sounds great! Lemon pound cake sounds fabulous! I like a lot of these scent concepts, but I can't find a page of just scents! Grape is Enough sounds nice though. If lucky enough to win, I would choose the Leave It To Bamboo Memory Melts! Calypso Cucumber Melon Memory Melt...I love the fresh scent! The heavenly marshmallow body melt! Thanks. I would love to try out the Alice Memory Melts!